Universal Music is pleased to announce a Deluxe, Super-Deluxe, a special vinyl and digital exclusive editions of T. Rex’s monumental ELECTRIC WARRIOR album on April 23rd 2012. It will be preceded by a box set of singles produced especially for Record Store Day 2012 (April 21st 2012). These new editions are crammed with previously unreleased demos and out-takes - the centrepiece of which is original producer Tony Visconti’s re-mastered version of Electric Warrior. This year is the 40th Anniversary of Glam Rock, or Glamiversary as some have christened it. Electric Warrior was T. Rex’s second album, released in September 1971. It was T. Rex’s No. 1 single “Hot Love” which sparked a movement that gathered pace throughout 1971 to become a fully-fledged phenomenon in 1972. 1971 was the year Marc Bolan broke big, and thanks to a touch of glitter under his eye when performing “Hot Love” on the March 10th edition of Top Of The Pops, he was to herald a new pop era, Glam or Glitter Rock. By the end of 1971 Bolan and Rexmania was as close as anyone had come to Beatlemania since 1963. Electric Warrior topped the UK album charts twice, from December 18th 1971 to January 29th 1972 and again from February 5th to February 19th 1972. The centrepiece is original producer Tony Visconti’s re-mastered version of Electric Warrior, which is presented with four bonus tracks - the non-album single, “Hot Love” (No. 1 in February 1971) plus the B-sides “There Was A Time / Raw Ramp”, “King Of The Mountain Cometh” and “Woodland Rock”. The second disc in the Deluxe and Super-Deluxe editions opens with Marc Bolan reciting a previously unreleased poem titled “The Electric Warrior” which was recorded for a US Radio promo that is featured in full at the end of the album. This is followed by an alternative version of the Electric Warrior album comprised from previously unreleased demos and out-takes. In addition there are unreleased demos recorded in London and New York of a recently discovered untitled instrumental from the “Hot Love” sessions and a T. Rex cover of Carl Perkins’ rockabilly classic “Honey Don’t”. 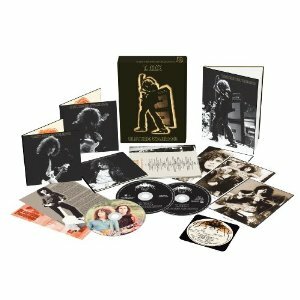 The Limited Edition Super Deluxe Edition of Electric Warrior will be housed in a lavish box set which is foil blocked and de-bossed and will contain the two CDs plus a DVD of rare and unreleased TV performances and promos by the group, and a wealth of additional items - alongside a 32-page hardback book featuring a brand new essay from Bolan biographer Mark Paytress (including new interviews with those who were close to Marc). The box also includes reproductions of rare photos and memorabilia: a poster including a timeline, three photographs, a coaster and a vintage press release. The DVD includes the only two surviving Top of the Pops performances from the BBC archive of T Rex’s Electric Warrior-era hits – “Hot Love” and “Get It On”, the latter featuring Elton John. The DVD also includes the previously unseen Blue Screen versions of “Jeepster” and “Life’s A Gas” from Germany’s Beat Club plus the actual broadcast versions of “Jeepster” and “Life’s A Gas”. The rarely seen official promo videos for “Get It On” and “Jeepster” are also included, plus live performances of “Girl” and “Cosmic Dancer” which were recorded at the performance of T. Rex’s historic Wembley Empire Pool concerts on March 18th 1972. These were not included in the concert film Born To Boogie which used none of the matinée concert footage. Universal Music Group will also be releasing a very limited edition boxset on Record Store Day 2012, Saturday April 21st containing four 7” singles pressed on heavy weight vinyl and featuring unique sleeves. Track-listings for the all formats are outlined below.